A Great Britain rugby league player who admitted being behind a fake ink cartridge and computer game scam has been jailed for 15 months. 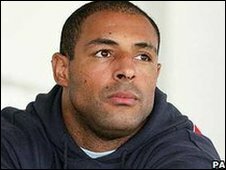 Former Hull FC player Gareth Raynor, 32, pleaded guilty last month to 14 counts of fraud and counterfeiting. Hull Crown Court heard Raynor ran a web company called Genuine-Ink and sold low quality ink on Ebay passing it off as high-quality named brands. Investigations by trading standards officers uncovered the £36,000 scam. The court was previously told Raynor, who signed for Crusaders in Wrexham in January, imported and reconditioned second-hand ink cartridges from China and re-packaged them to look like genuine brands such as Epson, Canon and Hewlett Packard. Nintendo DS and Gameboy cartridges were also imported and sold on the same false basis via the auction website. Trading standards officers with East Riding of Yorkshire Council raided his home in Brough in August 2008 and he was later charged. He was jailed for nine months for the counterfeiting offences and a further six months as a result of breaching a previous suspended sentence relating to a racially aggravated common assault.